Hi Everyone! Happy Sunday! I have work now every morning at 5:00, so I am both tired and not excited that I have to be up in a few hours... So I'm going to let Andra take this one away from me. It's quite the funny story how we "met" and here she is to "reconcile," even though I never thought her comment was snobby. You're probably confused. Just read on! I'll be back in the kitchen full force soon, for sure! Here she goes! Several weeks ago, Jessie posted a tasty Grilled Polenta with Spicy Ribeye. It just a hearty but summery recipe because of the grilling aspect. I seemed to have a problem with it though. Not with the grill, not the ribeye - with the polenta. Being that I am a polenta lover and connoisseur of sorts, I may have some snobbish tendencies when it comes to it. So I had a beef with Jessie’s polenta- she didn’t make it- it was the pre-packaged kind, something any self-respecting Romania has to frown upon as if it was some sort of cardinal sin. I left a comment. I told Jessie that she should make her polenta, that it is easy, and simple and blah blah blah. But then I felt bad. I felt like my comment was obnoxious. Here is a girl who cooks a lot, who makes healthy choices in food, who shares her experiences in the kitchen and here am I, the polenta-from-scratch police. 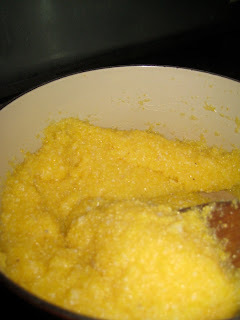 When Jessie tweeted about looking for guest posts, I saw that as a chance to explain the ease of polenta. And to say that I love her blog and her passion for cooking. So here it is- Simple Polenta, a FrenchPressMemos Romanian Staple! Ingredients: 1 large garlic clove, peeled; 2 cups chicken or vegetable stock (ha, you really should make this too-freeze it and use it whenever needed); 1 3/4 cup polenta, 1/2 cup heavy cream; 3 tablespoons butter cut in small pieces; salt and pepper to taste. Mince the clove of garlic finely. Bring the stock to a boil in a heavy bottomed pot. 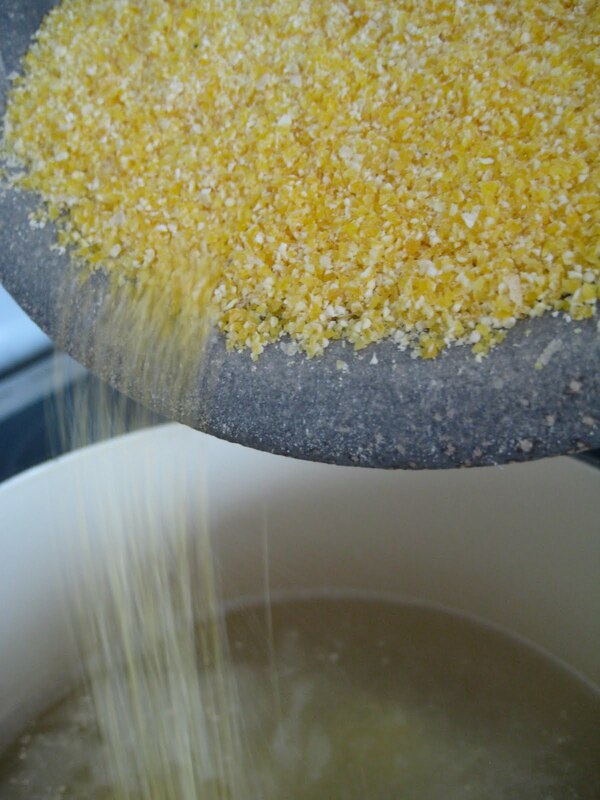 Add salt to the water - about 1 teaspoon. Add the minced garlic and reduce the heat to a simmer. Rain the polenta in stirring for a couple of minutes until there are no lumps and the polenta is well absorbed in the water. Cook stirring occasionally for about 20-25 minutes until it gets thick and most of the liquid evaporates. Turn the store off and start adding the cream in bit by bit stirring constantly to incorporate it. Do the same with the butter. Add salt and pepper to taste. This can be served soft immediately. If it isn’t creamy enough, add more butter or heavy cream. To grill it, set it in a pan to cool. After it cools, cut it up in the desired shapes and sizes and there you go, now you can grill it after perhaps you brush it with a bit of olive oil. 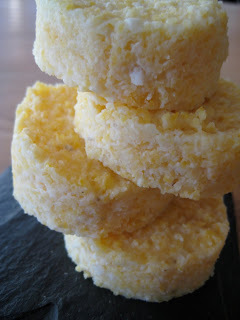 I cut it in rounds to mimic the packaged polenta but of course you can cut it in any shape you want. A knife works as well as a cookie cutter does. Serve it with Jessie’s ribeye! Some suggested variations include- water instead of stock- it just won’t come out as flavorful, but will still be delicious; shallots or onions minced finely and sauteed before being added to the boiling stock/water; thyme minced finely and added to the boiling stock; hot peppers- jalapenos or others minced finely and added to the boiling water; mascarpone cheese instead of butter; add grated cheddar cheese at the end to give it a cheesier flare; use milk instead of cream or more butter instead of cream (really any combination of milk, cream, and butter should work to get you to the creaminess and consistency desired. Most important- don’t be intimidated by making it. If it gets too hard, you can add water. If it isn’t hard enough, cook it until the liquid evaporates. There is no exact science, you can fix it and change it and serve it so many ways. And if you cut it up in rounds and you have all sorts of little pieces left over, consider lightly toasting them in the oven to dry them up and use them as polenta croutons in your lunch salad the next day. I'm ashamed to say that I made polenta for the first time last week to serve my grilled stuffed peppers on! I make a lot of cornbread but never polenta - go figure. Your instructions and photos are spot-on and I'm inspired to cut it into shapes and grill it next time. I hate to say this...but I've never made polenta before! I've had some delicious dishes where it starred as the main ingredient, but I've yet to attempt at home. I'm going to give this a try now...what a fun post! I've never made polenta either, but I don't just don't have a huge desire to. I guess I need to taste it first. I can't stand grits, which use corn meal too, so I just assume that it'll taste the same and have the same consistency. It is definitely nice to learn even more about food from a good story!